Adelaide is generally blessed by an amicable climate but it does have its grey days. Usually the winter showers are interspersed with long fine periods when the sun shines through the clouds and brightens up a chilly morning. Today was not one of those days. I had been staying at some lovely little units on the edge of the foothills and planning to take some shots in the gardens to promote the virtues of a South Australian winter’s day but the weather refused to cooperate. It was overcast with a little drizzle and no sign that the curtain of clouds would lift. Undaunted, I headed into the manicured grounds looking for something to lift my spirits and lend a little colour to the day. 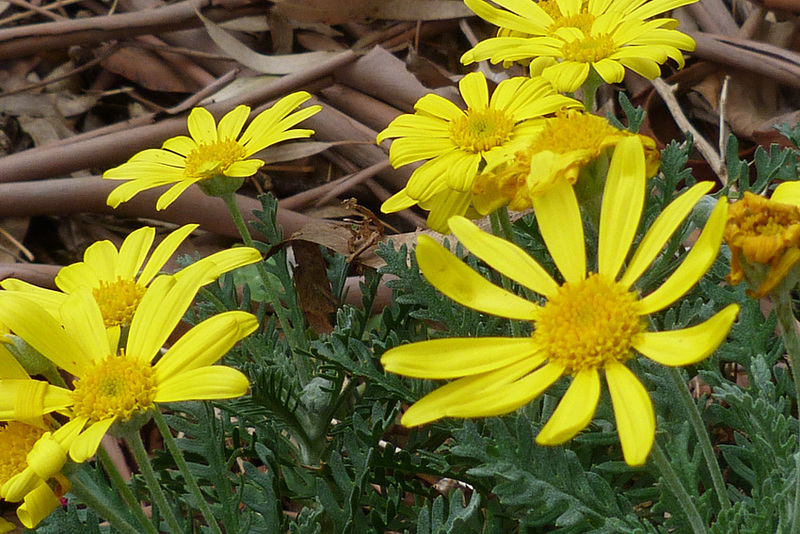 Fortunately, the perfect candidate was growing right in front of my unit in the form of a robust Euryops bush; a non native, daisy species that blooms right through the winter months. Despite the cold weather, the bush appeared to be supporting a small but diverse population of insects some of which I would normally associate with the spring and summer months. 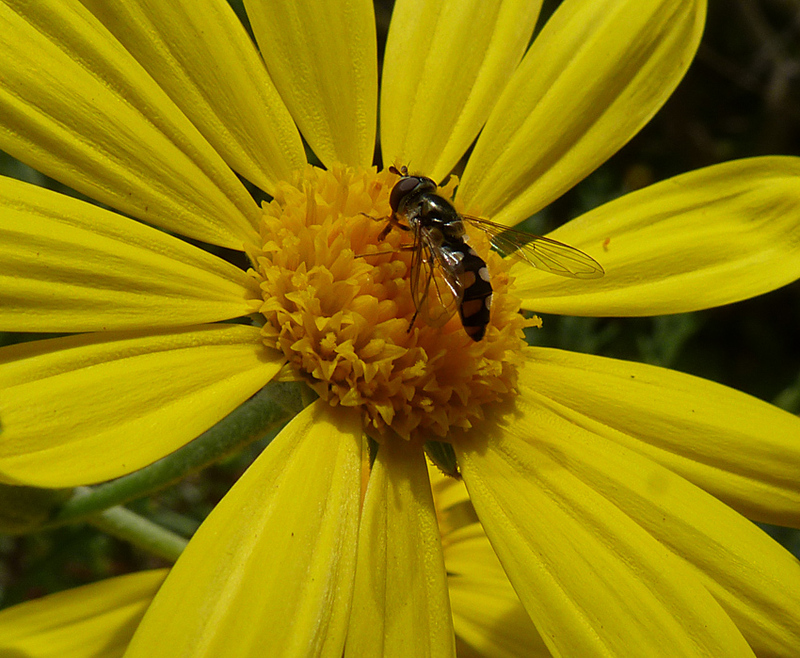 A couple of hoverflies were sitting in the centre of the flowers probing them with their stout little proboscises. 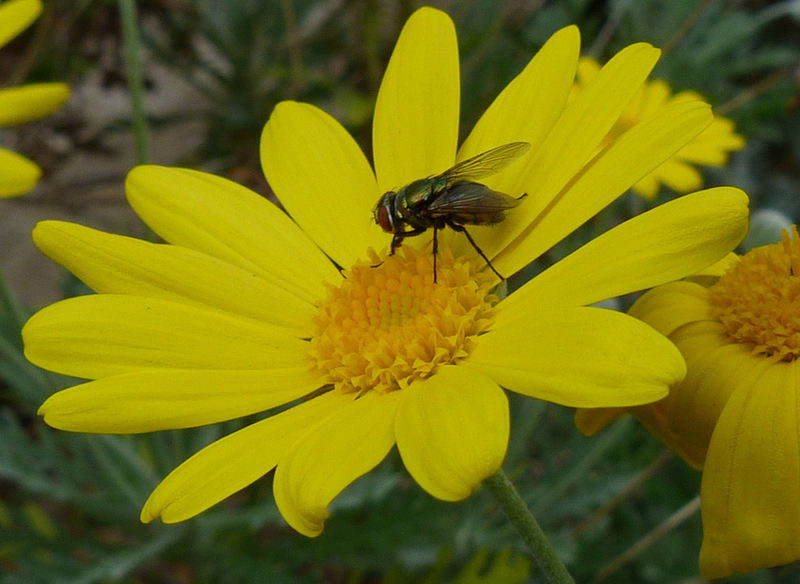 These hornet coloured little insects usually flit between flowers pausing for a brief instant to feed. The cool weather seemed to have slowed the insects down a little and made them for more amenable to having their portraits snapped. 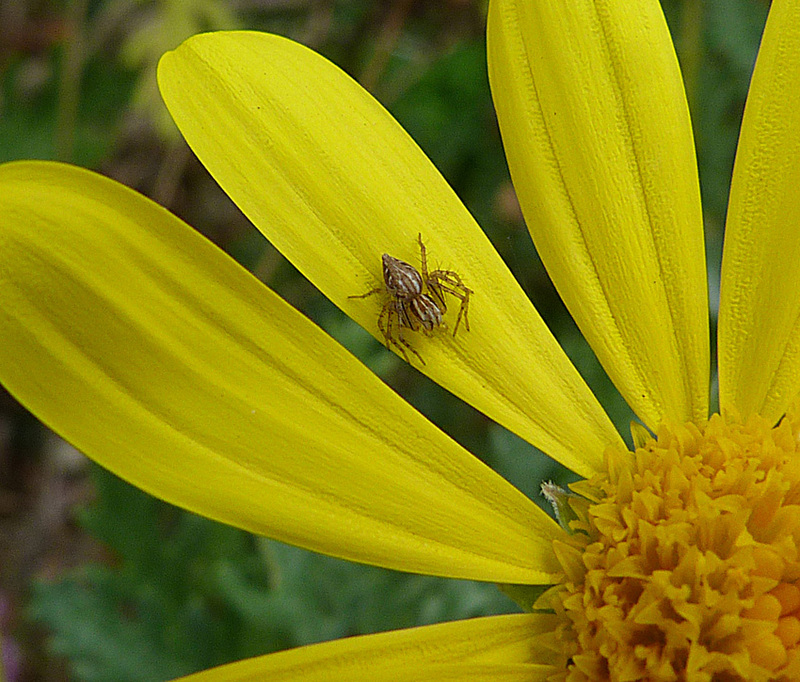 Euryops blossoms provide are the whole world for a common flower spider. I watched through my lens as one wait immobile on a petal for several minutes then moved to another one to maintain its frozen stance, primed for a sudden jump should either prey or predator come too close. During the day I caught glimpses of several different species of flower spiders and they are certainly an interesting group of common garden animals worth exploring further. The winter months see a decrease in virtually all arthropods especially spiders and insects. The common bush flies that can be a nuisance in summer and early autumn are a welcome absence in the winter. However, several of the more solitary species of flies seem to persist through this chilly season. Their iridescent green bodies and bright red eyes provide a striking contrast to the bright yellow flowers as they probe their dense centres searching for nectar in the delicate folds. 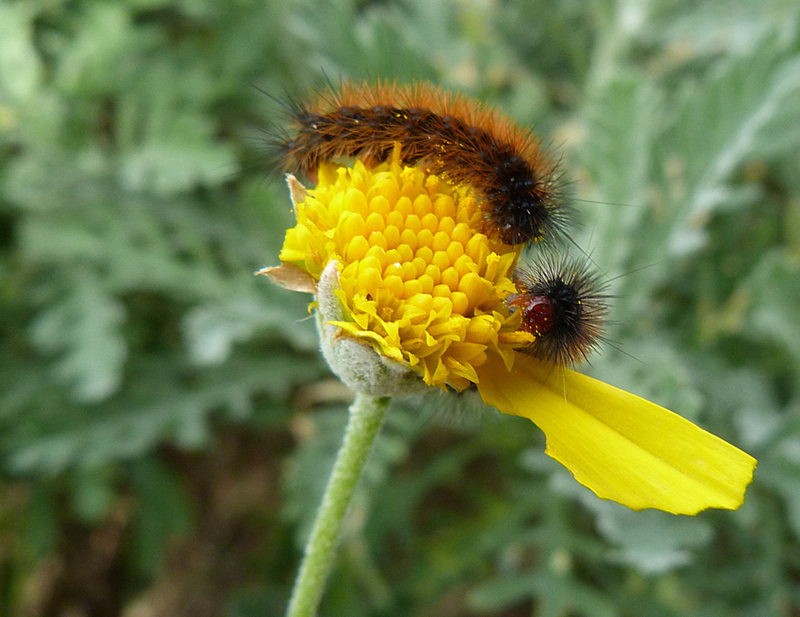 Perhaps the most prolific insects that I saw on this grey, chilly morning were the common woolly bear caterpillars that appeared to be munching both the leaves and flowers of my Euryops bush. These furry little creatures grow into black and white tiger moths and seem to be immune to the cold weather that decimates other insect populations. Indeed, I seem to remember that they can survive temperatures below freezing because of the glycerol, a form of anti-freeze, they produce. Then the rain came down and sent me scampering inside for a glass of mulled wine and time to review the images I had captured while thinking about the next sunny day.